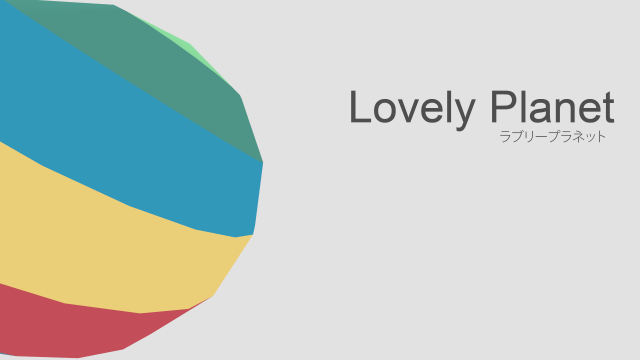 Lovely Planet - Can you deal with it? 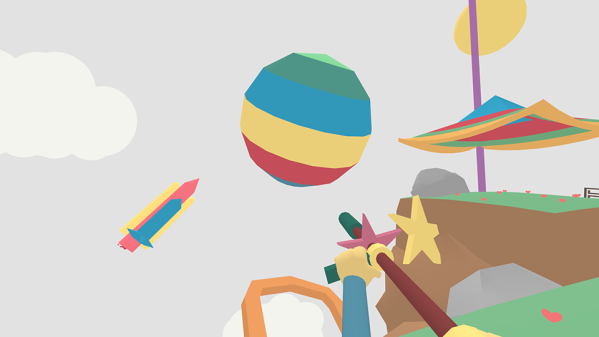 Lovely Planet is a 3D first person shooter focused on classic run-jump-shoot gameplay, developed by QUICKTEQUILA and published tinyBuild on July 31, and is available for Mac, PC and Linux for $6 through Steam. I started on this review a few days ago, but every time I started typing, I just had to go back and have a stab at one more level. The silly, cozy and incredibly addicting competitive edge this game has, makes me go back to it more often than I would like to admit. The lack of any real story and a playful, childlike look and feel, is a welcoming diversion when you don’t want to think about k/d ratio, annoying team mates and explosions for a while. This is so simple, so basic, yet so complicated. All you have to do is shoot all the enemies in each level and reach a pole at the end. Sounds easy enough, right? 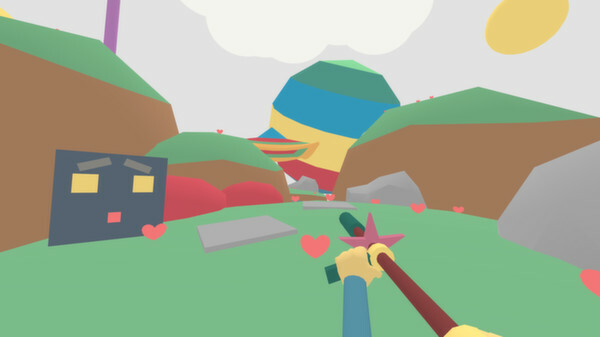 The first time I started this game, my initial response was “What the hell is this?” After finding my way out of an odd menu, with barely any information in it, I was standing on a piece of land floating in the air, equipped with what looked like a stick with a star attached to it. My surroundings can best be described as cartoon looking, every element displayed in smooth primary colors. The world is, as stated before, floating in the air, consisting of small pieces of land with odd decorations like handbags and rocket ships. While standing there, thinking “what am I supposed to do now?”, I just started walking. That was really the only thing I could do. There is no story, not really much of a tutorial to get you started either, and no waypoints. Just a strange soundless intro, showing off the unusual graphics, and as the game starts, so does the music. And to be honest, it fits the game, but whether or not you will like it, is another matter. Although it adds to the feel of playful haste, it might feel repetitive after a while, and some might choose to turn it off. The in game sound effects are basic and silly like the rest of the game, you don't have to rely on them for anything either. Maybe playing your own choice of music might work just as well. When I got to that purple pole the first time, and the level surprisingly enough was completed, I had no idea what the stats meant, or if I did good or bad. I could find no explanation anywhere. How and why I earned the stars that showed up, I had no idea. I guess it would be nice to know, so I could try harder to get them all… I did figure out that the "A 78%" meant my accuracy, and the times speak for themselves. The how and what regarding the stars came to me after playing quite some time. The first star is given for completing the level. The second is awarded to you if you beat a set time, marked as "Q:". Finally, if you complete the level without wasting a single projectile, you will get the third and final star. I might have to go back to some levels, as I had no idea back when I completed them, and make sure I get that final star. You can choose to use a controller, but it is evident that Lovely Planet is supposed to be endured with the use of mouse and keyboard. The layout is fairly simple, all you have to do is move, jump and shoot. There is no duck, cover, roll or other extras, so no fancy customizations are needed. Your “stick” will fire an infinite amount of slow moving projectiles, purple blocks that will destroy the bad guys that stand in your way on your journey towards your goal, the purple pole. You have to take them all out, in order to finish a level. Some of them are stationary carrot looking figures that will not fire back, but others most certainly do, some of them even have homing projectiles, so you got to keep your wits about you. You also have some mysterious apples that will come flying at you, make sure to shoot them before they hit the ground. If you fail, you will have to restart the level. I might have forgotten to mention that, this game has no mercy with sloppy play. Miss once, and you will be instantly reset to the beginning of the level. Those misses include touching the red blobs spread around the maps, shooting a neutral dude, not shooting a bad guy, getting hit by a bad guy, failing to hit a flying apple, jumping too soon, not jumping soon enough or shooting and destroying a platform you need. Oh, and it is timed, you know. Best get a move on. Oh, and remember to look out for those spikes on the ground too. There are 100 levels, and they get increasingly more difficult. You will have to memorize every little detail to get through some of them, and it is almost impossible without going into complete precision mode, and let your eye to hand co-ordination take over. Your are able to spin while jumping, and you better get used to doing that, as it is required to nail some of the maps, and it will also help you to shave some time of your laps to get closer to the scoreboards. It is not inventing anything new, this game, there are not many surprises once you get into it. You get a lot of frustration, a lot of repeating the same over and over again, which allows you to get through even the most difficult levels, if you just grind long enough. And that satisfaction, when you finally do, makes you forget about all that pain. Lovely Planet is unforgiving, make one mistake, and you are done. Then again, failure is not lingered upon, you just start over. It is in the spirit of the name, lovely in a way. And if you manage it get past the level flawlessly, you might end up on the scoreboard. World record, you say? This feature was added in a recent update, when released Lovely Planet did not not include global leaderboards, outside of one nameless world record per level. It just makes sense that a game built for speedrunning would show off the best speedrunners, and after the update on August 6th, leaderboads was added. It may take a 100 replays, but you can now etch your name on a bragging wall if you manage to get one of the top 15 best times. The full leaderboard is only accessible after beating a level, and there is still no way to check the rankings from the somewhat useless menu. Hopefully this will be available at a later date, as it would be nice to check if you still have your name on the list, if you finally managed to earn a spot there. The drawbacks are the lack of story and the visual aspects. Although happy and playful, I never really found myself amazed by any of it. Graphics are silly and whimsical, and doesn’t care about lighting or textures, which is fine by me, but the levels are the same all the way. Not like in some Nintendo titles sharing a similar philosophy, where worlds would expand and evolve. Here, changes are minimal. The story is more or less non existing, the mysterious, abstract cutscenes between levels are all the explanation we get to why we are on this journey. I have no idea what they are trying to tell me, and I doubt I ever will. All in all this is a different, merciless speedrunning platformer and first person shooter with a middle of the board presentation. I really recommend giving it a try, despite its flaws, you definitely get your money's worth, after all it only costs $6.